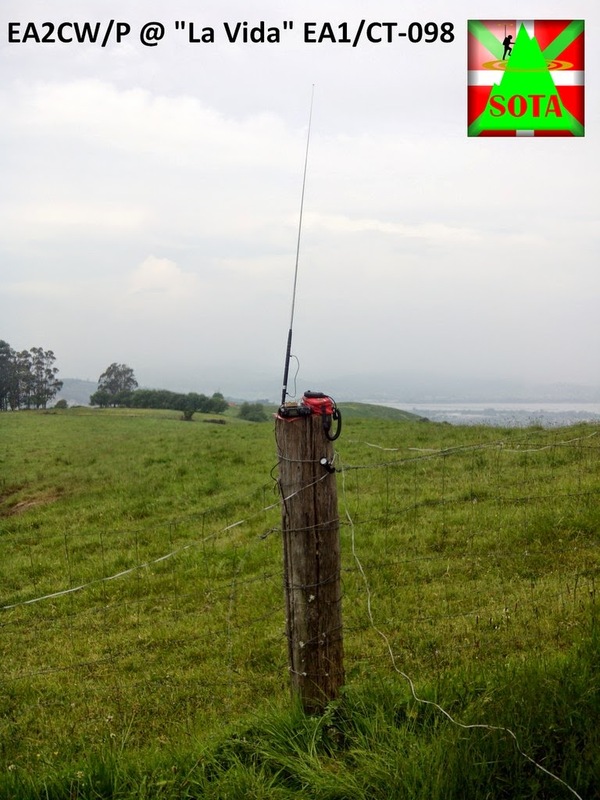 EA2CW: "La Vida" (Life) EA1/CT-098, an odd activation. Today was a really odd activation. It might be a short one, as I might later go to work. I didn't know the route, as it was going to be my first EA1/CT region activation. It would be no matter with summit height (an impressive 264 m), and just about 200 m to hike, after leaving the motorbike parked. I need also to make it short as some rain was announced, and I didn't want to go back home on the bike (54 km) under the water. Carrying the 9m mast on the bike is quite problematic. So, I decided to use, by first time a vertical portable antenna (SPX-100) ( +- 1,5 m telescopic and coil). I want to test it as an alternative to the 20 m. length switched dipole, but I didn't expect brilliant results, being used to the "real/royal" one. Unfortunately, the area is surrounded by a metallic fence that would act as a perfect Faraday cage for my small antenna & power. So, I chose to put the FT-817 on top of one of the posts (just 15x15cm area), cw keyer on top of the xmitter, LiFePo4 on the side (red plastic box), and the watch, pencil and notebook hanging. On the other side, I was able to connect my three 5 m radials to the wire fence, so it made a very good counterpoise, I think. The bad side was that this position keep me standing up all the activation long. Perhaps some of you have noticed the long lapse between calls and being answered, or the bad keying. Well,it was really tricky to (without my 8 needed hands) manage the keyer, notebook, pencil,etc. That was a bit better later on SSB. So, final results: 41 QSO's, no S2S, 3 continents (AU, EU and NA) .